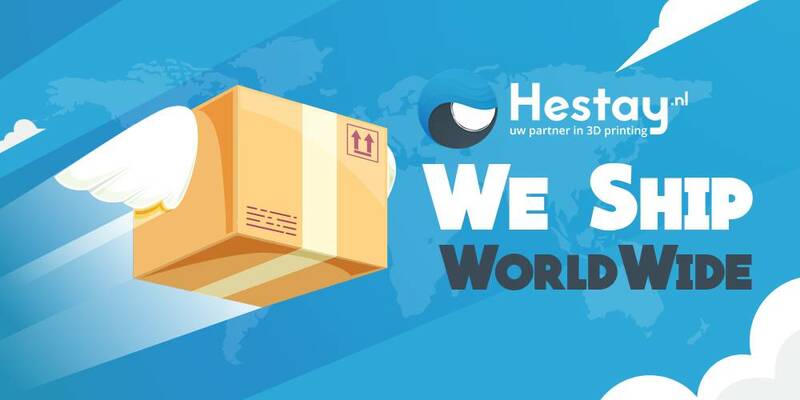 Hestay is your partner in 3D-printing. We have everything you need to start with 3D-printing right away, it does not matter if you are a beginner or experienced, Hestay has the materials for you. Not only does Hestay provide you with the right 3D-printing materials, we provide you with the necessary extra information about our products on our website to avoid problems and to get the best out of your 3D-printed creations! Filament is the main source of plastic for the 3D-Printers and is used to build your 3D-Printed creations. We not only offer you the most used materials like PLA filament and ABS filament, but also exotic materials like Flexible filament used to create elastic rubberlike creations or the strong Nylon filament used for high strength projects. Next to these filaments we also offer: PETG, Wood and the water dissolvable PVA filaments. Every material is supplied with the proper information on what to expect from the material, how to use it, set it up and of course print it. We created a filament comparison page to help you choose the correct filament for your projects. In this comparison, all the 3D-Print plastic materials are compared on their specifications, types of use and pro’s/con’s. Every filament is available in the 1.75, 2.85 or 3.00 mm diameters to work with almost every 3D-printer on the market. All three diameters are produced with a maximum diameter tolerance of ±0.05 mm to ensure that you have a smooth 3D-Printing experience. You can find our whole assortment of 3D-Printers on our website. De 3D-Printers are made by Builder, a Dutch 3D-Printer manufacturer holds a high standard for the quality of their 3D-Printers. Every 3D-Printer is extensively tested before leaving the factory to make sure you have the best 3D-Printing experience possible. If you want advice or extra information regarding choosing your own printer, please feel free to contact us for any assistance you might require.